Soft understated watercolours with dark outlines create the visual scenes while the simple prose tells a story of nature and the Sun’s travels. It creeps up over snow-filled hills before it touches water and a fisherman’s hat which flies off with the wind. The golden ball steams through the water over a whale, and sets off across bushland to cast shadows upon snow and footsteps. High in the sky it meets birds and a plane and shines through portholes. It crosses cities and waits outside windows to enter. It rises high over countrysides to awaken animals and birds, and catches travellers in their tracks, follows villagers, boats and eagles. The Sun shines over high-rise buildings, meets the dark and makes it dawn, and then explodes into Coco’s window. It shares itself with Coco’s mum and dad still in bed, and accompanies them all to breakfast. When the Sun and the children have time on their hands, then, that is the best part of the day. 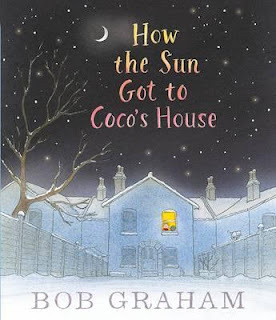 Always stunning and utterly thought-provoking, Bob Graham’s work is like the Sun on a cold day; welcome and refreshing, necessary and irreplaceable. Strong themes of freedom, the value of the Universe and its protection, are the motivators of this exceptional creation.